Bring a touch more green indoors with these sweet, simple hanging “trapezes” for Tillandsia. They’re easy to make with a square-cut dowel and suede cord. Use the cord to hang the trapezes on a wall that receives bright, indirect light. Nestle a Tillandsia or two in the corners of the hanger, near the cord. The plants’ curly tendrils will hold them in place. Once a week, remove each Tillandsia and soak in water overnight. Large rosette-shaped Tillandsia look fantastic resting on top of one another in shelving made from old fruit crates. 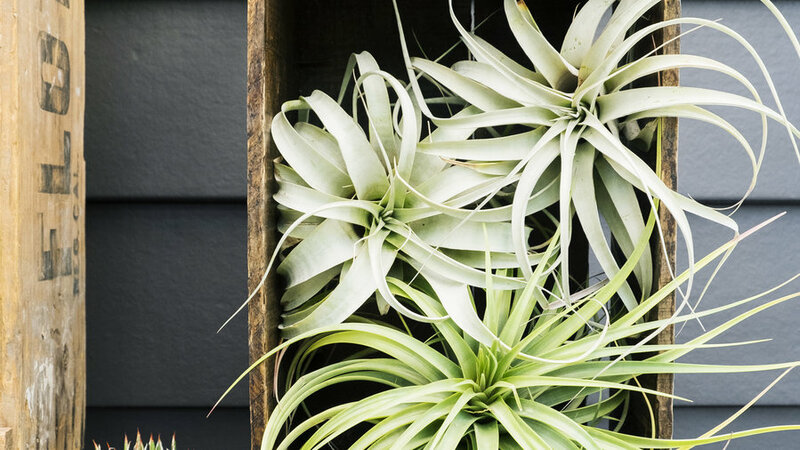 Tillandsia can live outdoors in temperatures ranging from 50° to 90° in bright, filtered light. Spokes from an old bike wheel make perfect nooks for Tillandsia to nestle. Display above your bed as a dream catcher. Or hang it from the center axle in a bright hallway and give it a spin for good luck every time you pass. 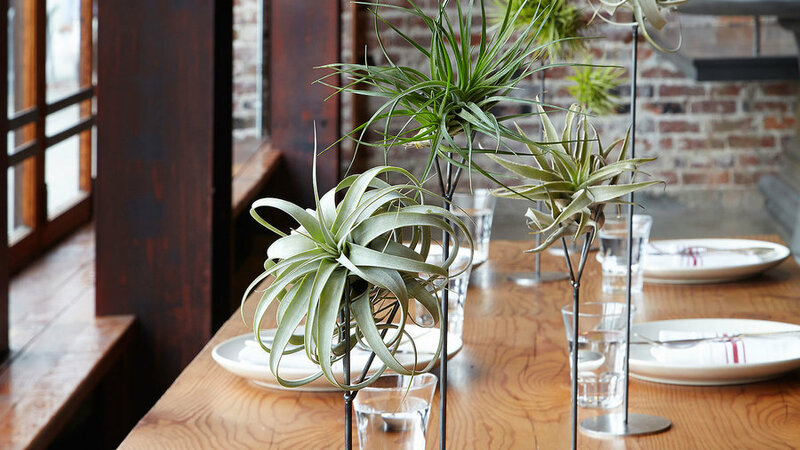 Supported by Thigmotrope Perches (available in four heights from ), elevate a collection of Tillandsia into a dignified table display, easily moveable when food arrives. 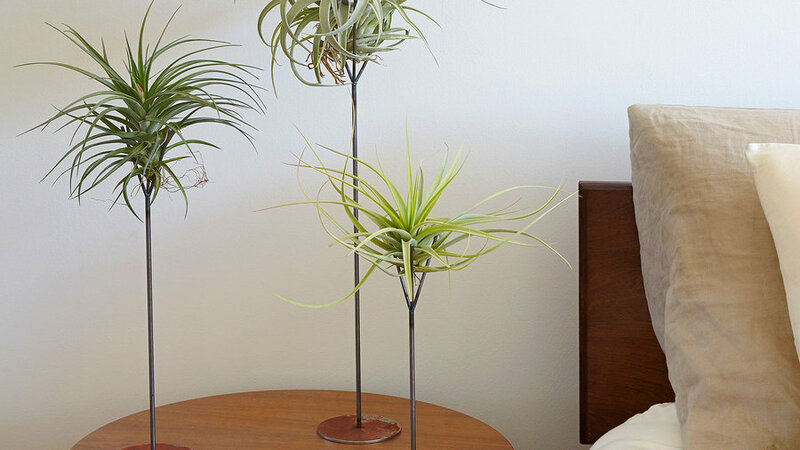 Not known to snore, kick, or take up too much room, Tillandsia make great bedside companions. Keep them loose, in a dish, or in holders made just for them, like these Thigmotrope Perches (available in four heights from ). The three prongs cradle your plants, allowing for easy removal for watering and rearrangement. 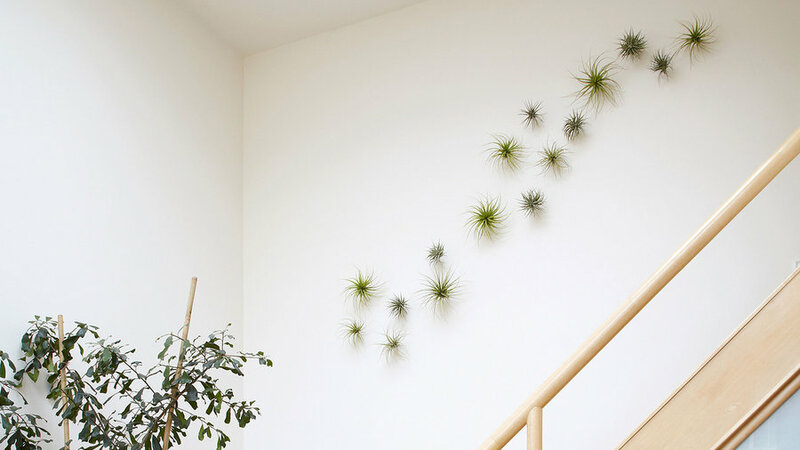 Since Tillandsia don’t need soil, they can follow you anywhere—like up and down the stairs of your home. 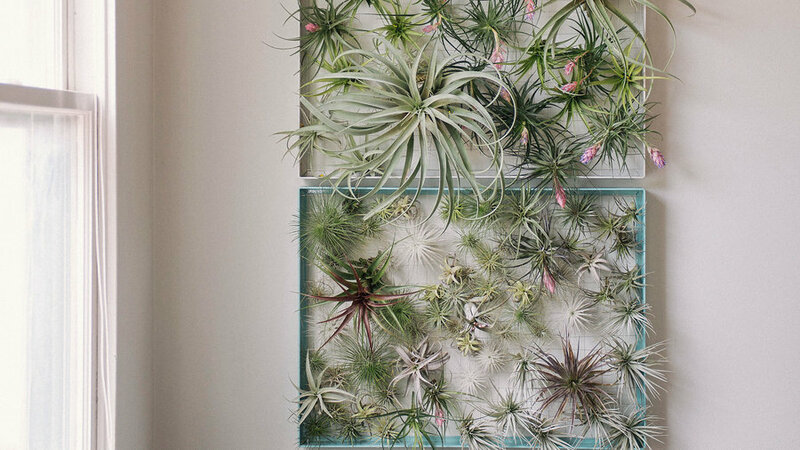 Here, a collection of Tillandsia is cradled in steel tripods that screw directly into drywall or a wood plaque. Using a pre-drill, they can screw into concrete. Thigmotrop satellite hangers, seen here, available from . 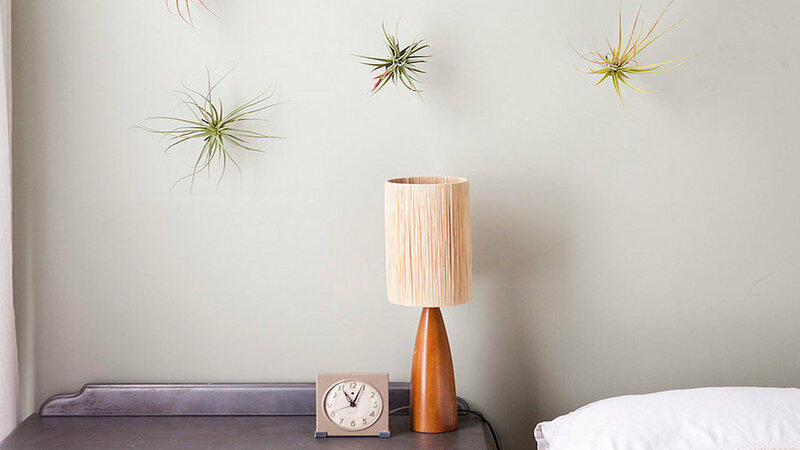 Create a cosmic dreamscape above your bed with a constellation of Tillandsia. They can hang easily on fishing wire, or use steel tripods (available from ) that screw directly into your wall. 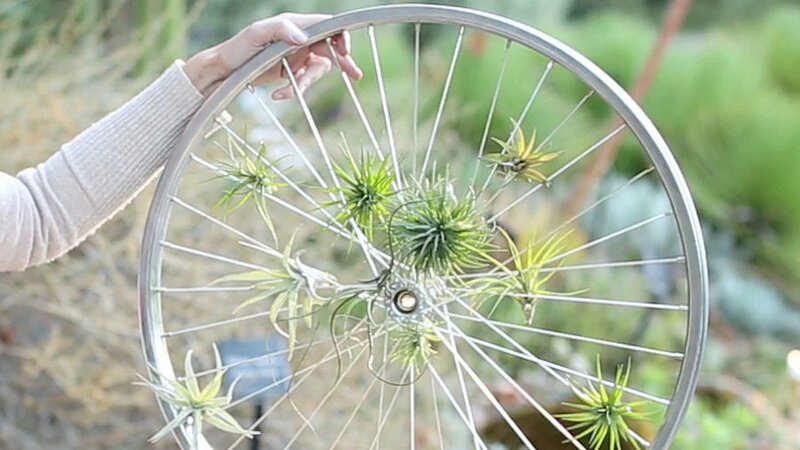 Who needs stagnant art when you can create your own, dynamic masterpieces with Tillandsia? Here, an assortment of colorful Tillandsia hooks easily into the wire grid of an AirplantFrame (made by ). Made from powder-coated rustproof aluminum frame, you can dunk the entire thing—plants and all—overnight in water once a week, let it dry, and hang it right back up. Design: . Mimicking the narrow, rectangular span of windows, a hanging wire grid becomes the perfect canvas for Tillandsia. Their placement above the kitchen sink is easy access for their weekly soaking. Fabricate your own grid out of wire mesh, or buy the AirplantFrame (), made in California. Design: Josh Rosen, AirplantMan (). Bright, indirect light is perfect for Tillandsia, but if you up the humidity, as happens in a steamy bathroom, they can handle even brighter light. 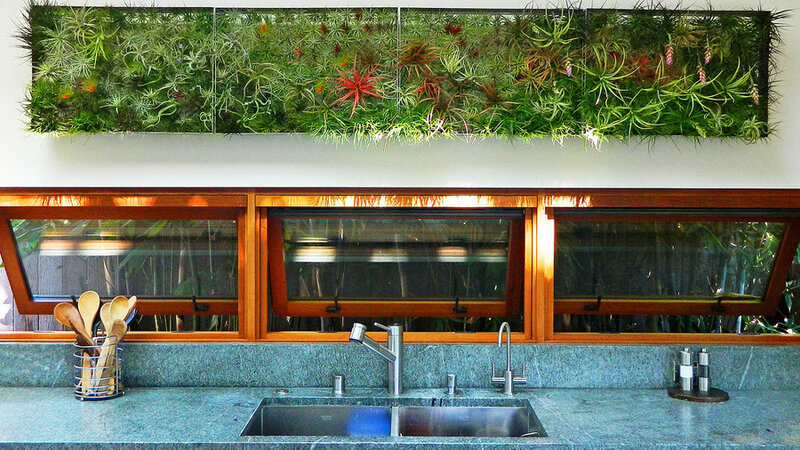 Always optimize for light—so if your bathroom is dark, keep your air plants in a brighter spot. 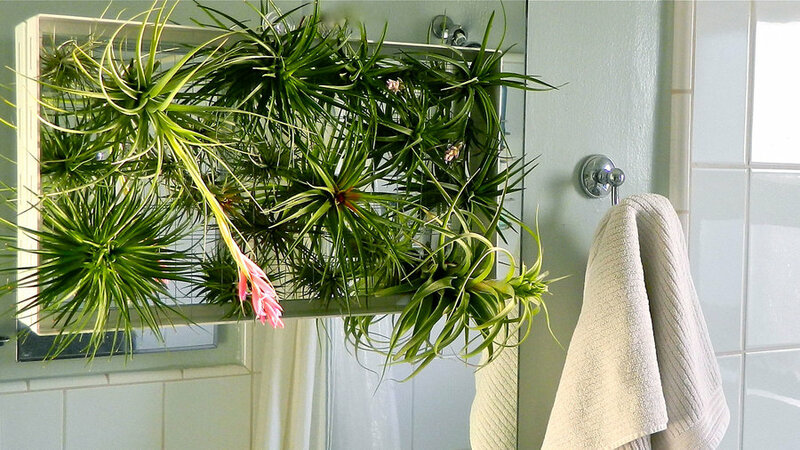 Here, a sparse bathroom gets a dramatic upgrade with a wire frame stuffed with Tillandsia. Fabricate your own grid out of wire mesh, or buy the AirplantFrame (), made in California. Design: Josh Rosen, AirplantMan ().